It’s hard to beat the creative and social energy of starting your weekend with an Art Opening…Northfield Ties: A Photography Invitational, curated by Patsy Dew and Meg Ojala, features the work of 13 photographers who have ties to Northfield. Artists exhibiting are Patsy Dew, Scott Forsgren, Doug Foxgrover, Beret Griffith, Dennis McClintock, Meg Ojala, David Perez, Craig Perman, Stephanie L. Rogers, Linda Rossi, Leslie Schultz, Katie Shorey, and Cate Vermeland. Come on down(town) and join the fun. 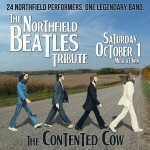 Friday, September 3oth: Carey Langer, 5:00 to 7:00 p.m., Contented Cow; Art Opening Reception: Northfield Ties, 7:00 to 9:00 p.m., Northfield Arts Guild; Bonnie and the Clydes, 8:00 to 11:30 p.m., Tavern Lounge; Marty Anderson and the Goods, 8:00 p.m. to 12:00 a.m., Contented Cow; Karaoke, 9:00 p.m., Rueb’N’Stein; and Foreman Band, 11:00 p.m. to 1:00 a.m., Contented Cow. 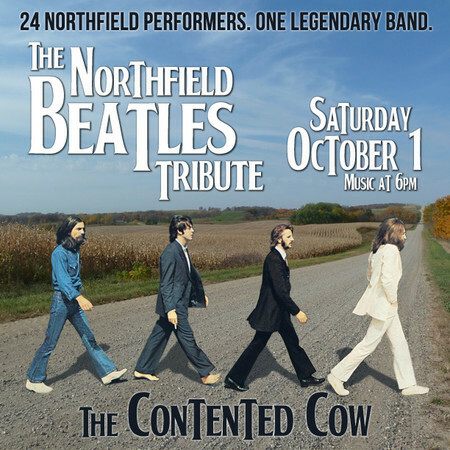 Saturday, October 1st: Riverwalk Market Fair, 9:00 a.m. to 1:00 p.m., Cannon Riverwalk; Beatles Tribute (pictured), 6:00 p.m., Contented Cow; Down By Law, 7:00 p.m., Weitz Center for Creativity on the Carleton College (downtown) campus; Western Union, 8:00 to 11:30 p.m., Tavern Lounge; and D J Music, 9:00 p.m., Rueb’N’Stein. Sunday, October 2nd: Cellist David Carter and Pianist Lori Folland, 3:15 p.m., Urness Recital Hall on the St. Olaf College campus; Politics and a Pint, 6:00 p.m., Contented Cow; St. Olaf Chapel Choir: Vespers, 7:30 p.m., Boe Memorial Chapel on the St. Olaf College campus; Northern Roots Session, 7:30 to 9:00 p.m., Contented Cow; and Quiz Night, 8:00 p.m., Contented Cow.